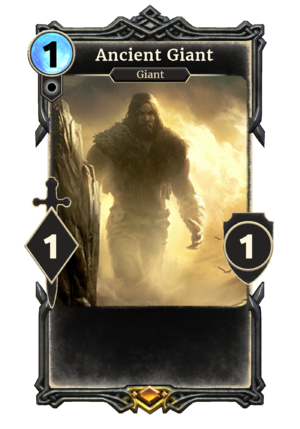 Ancient Giant is a legendary Neutral creature card. It is created when a card (such as Desperate Conjuring and Balmora Spymaster) attempts to create a creature at a magicka cost that has no creatures, at which point the Ancient Giant is created with magicka cost and statistics equal to the intended target magicka cost. For example, a Desperate Conjuring played on an 12-cost card such as Odahviing will produce a 14/14 Ancient Giant. Giants first appeared in Daggerfall, and since have reappeared in Skyrim and ESO. Ancient Giant's default values are 0-cost and 1/1 stats, but this can only be seen with bugs as only its 12+ values should be seen in-game.